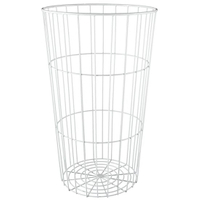 1100mm x 470mm 13.3'' x 18.5"
Basket Height x Diameter 180mm x 400mm 7.0" x 16.0"
This 3 tiered basket floor stand product showcase is a great marketing bin for any retail store, convenience shop, and more. Each large open top bin allows merchandise to be elevated 10 1/2” for the consumer to access with ease. 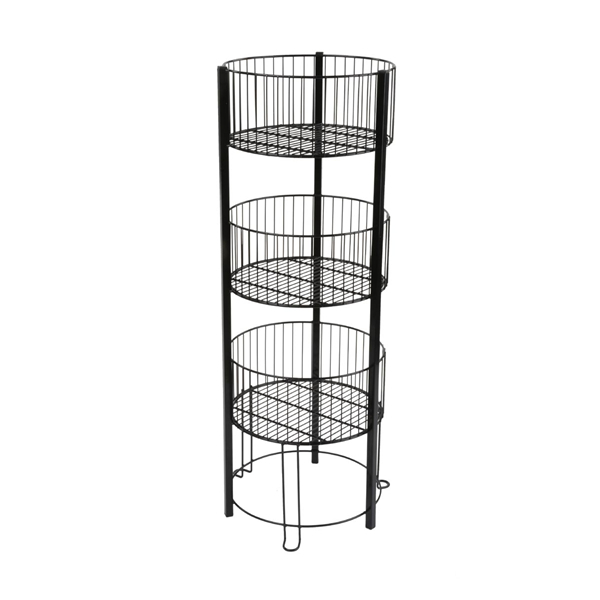 There is no lack of space with this tiered basket floor stand that has three open stacked compartments, each measuring 7” deep and 16” in diameter. The multiple levels are ideal for mixing and matching retail products being shown. This elevated merchandise display, tiered basket floor stand shows an abundance of goods aiding in increasing impulse sales. 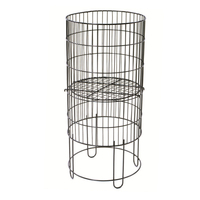 This wire dump bin allows for an eye catching three tier open metal drum display to encourage browsing. Each tiered basket floor stand that is preassembled as one piece allows for a quick and easy set up! 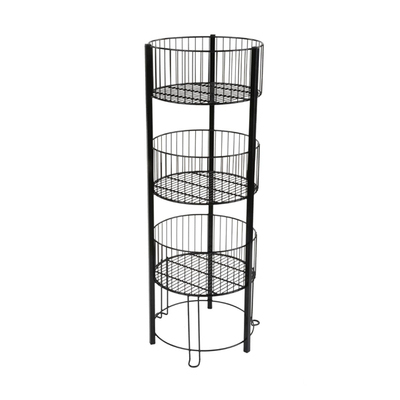 The space between the (3) tiers is 7 1/2” which makes it easy to stock and reposition merchandise. Each tiered basket floor stand is constructed with strengthened legs for reinforcement. This wire dump bin is manufactured for optimal stability. 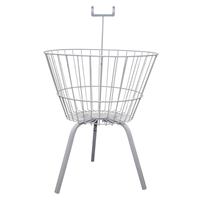 Needless to say, this is a tiered basket floor stand that is durable. The glossy black powder coated finish coexists well with any retail décor. 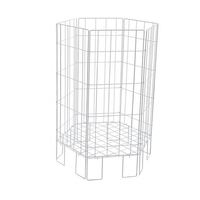 This wire dump bin, tiered basket floor stand is great for bulk storage and showcasing an abundance of merchandise while taking up minimal surface area. Each assembled wire dump bin allows for products to be stored on racks high enough for the consumer to view effortlessly. 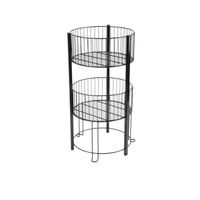 The store fixture, tiered basket floor stand offers a way to present an assortment of retail goods. The multiple levels allow for a variety of items to be displayed. The multi-level rack is a great unit to add to any retail environment to display sale items, seasonal merchandise, promotional finds, or everyday steals. This tiered basket floor stand, called a retail fixture, offers an alternative shelving option to better display merchandise.